This study addresses the often-competing goals of organic fertility and weed control by evaluating alternative orchard floor management strategies for their impact on N cycling, tree performance, and soil biological activity in a newly established apple (Malus domestica Borkh.) orchard. The standard tillage weed control practice resulted in satisfactory tree growth with desirable levels of leaf N and most other nutrients; however, soil biological activity did not improve. 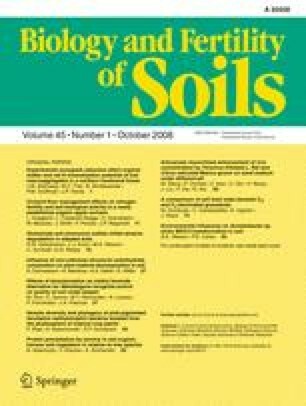 Maintenance of a living cover understory increased soil N concentration and availability and improved soil biological activity; however, tree growth was less than in other treatments likely in response to competition with the living cover understory for space and water. Application of wood chip mulch resulted in exceptional tree growth which may have resulted from greater water availability, but available soil N was lower, and consequently, tree leaf N concentration was low; in addition, soil biological activity was not improved. Clove oil organic herbicide provided poor weed control resulting in lower leaf N and tree growth and did not improve soil biological activity. Brassicaceae seed meal applications enhanced N availability and soil nematode abundance, but leaf N and many other nutrients were below desirable levels, and additional research is needed to optimize this treatment. We conclude that meeting the multiple objectives of weed control, optimal tree health, and increased soil biological activity may require employment of different orchard floor management strategies at different times during the life of the orchard. Sincere thanks to Kent Mullinix and Amos Kukes for making available the Wenatchee Valley College Research and Demonstration Site and for their assistance with plot maintenance. We thank Michel Wiman and Kaz Lorentz for efforts in plot maintenance and data collection; Debbie Bikfasy and Antonio Izzo for their guidance; Rowena Porter and Ben Siks for assistance in laboratory analyses; and Mark Evans and Stewart Higgins for assistance in statistical analyses. This work was conducted, in part, with financial support from the Washington State University Center for Sustaining Agriculture and Natural Resources.